We all aware about ‘ What is Module ? ?’ and What is ‘Diametrical Pitch’ . Both these concepts are function of pitch circle .So let us Understand the meaning of pitch circle first. Any gear system, the pitch circle is the imaginary circle that connects the points on the gear where two interlocking gears meet. The pitch circle divides the gear’s tooth into the top of the gear tooth , or addendum, and the bottom of the gear tooth, called the dedendum. At any point where two gears touch, their pitch circles will be tangent to one another if the gear system is designed correctly. 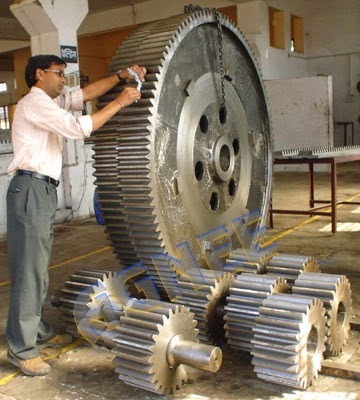 Module is a ratio of Pitch circle diameter to total nunber of teeth on a gear or pinion. The Module have standard values like 4,5,7 likewise, it is not given in fraction at all. Unit of module is Millimeter. 1) Module gives total idea about the Gear size either small or too large. 2) Gears are basically designated by using module and number of teeth ,meaning of this is that If Someone wants to buy a gear ,he need to ask gear by module and number of teeth. 3) As already menstioned Pitch Circle is imaginary circle .we can’t measure practically to Pitch circle diameter. It can be found with help of module and teeth .Obviously from formula one can easily find the pitch circle diameter. 4) while designing gear first module is decided according to speed ratio and number of teeth. Further this module is used to calculate remaining gear parameter like addendum ,deddendum etc. Diametral pitch is also called as diametrical pitch. Diametral pitch is reciprocal of module i.e. Ratio of number of teeth to Pitch circle Diameter. ordered. When a gear system is first designed, diametral pitch is important because it helps determine what size and type of gear is needed to interlock with any other gear. transferred. For example, the ratio of the number of teeth on one gear to the second gear needs to be the same as the ratio between the first gear’s diametral pitch to that of the second gear’s.